It has been a tough decision to take and a long time desire. We needed a lot of money to take David to dolphin therapy this year too. Honestly we almost gave up hoping that we would do it and only several phone calls from Dr. Murat convinced us to get ready and fly to Antalya in less thank three weeks. We wish to thank to all our friends that supported us in our adventure. Before writing about therapy and the trip I would very much like to tell you some things about Dr. Murat. When he was a child he witnessed the hard work of his mother (she is a pediatrician) and the failure of the society to cure or at least to ameliorate the suffering of the autistic children and their family. At that time in Turkey autistic children were badly treated in specific facilities. Murat could not believe that these children were hardly beaten and cast off from society. Later on, he studied medicine, got a scholarship in USA and returned to Turkey where he started his work as a psychiatrist. During his studies at university he made a lot of research about autism. He combined this knowledge with the results of David Nathanson’s research about dolphin therapy and founded the first dolphin therapy center in Turkey, one of the most known in Europe. Murat is a jolly person and his permanent smile is almost never wept from his face, not even when he is working with hardly affected children that for simple people like us seems heart breaking and extreme demanding. When he is taking care of an autistic child he never forgets about child’s family. His therapy takes into consideration the whole family. The way he talks and acts when he is near an autistic child’s family brings harmony and peace to all. He is, after all, a soul whisperer. There is no way we can thank you, Murat, for what you are doing. We pray for you and hope that God, no matter from which point of view – muslim or christian will kindly reward your efforts and touch you with His grace. This year David enjoyed again being with the dolphins and swimmed alone with one dolphin several times, without the help of the therapist. Soul Scince School team, Dr. Murat, Seid, Mo, Rachel – they all made us feel like home. They took us to remote places, fantastic landscapes far away from the permanent noise of the touristic resorts. Mo and Seid and also the guitar that Dr. Murat played one day for us. 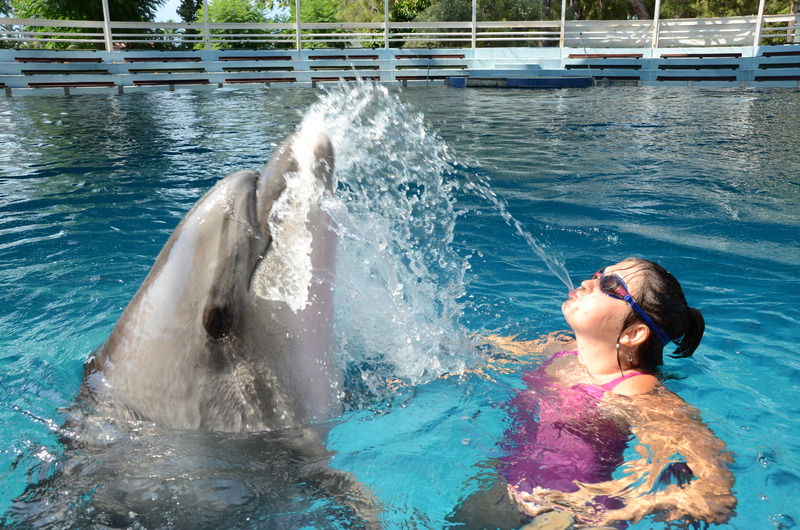 We don’t know for sure how the dolphins heals autistic children. They are calm, always happy and smiling. But their effect on us is behind our understanding. We had the fantastic joy of swimming next to them, to caress them and to thank them for what they’ve been doing to David. Just as in the first year the dolphin therapy’s effects on David were easy to see immediately. For the first time in his life he made a remarkable thing. I was calling his name and he answered me „I’m here!”. He talks more clear know, taking his time to express himself. Sometimes we are suprised to hear him completing one of our sentences when we are talking even if he apparently is not attentive. Especially when we are telling stories about our trips. Coming back home, David is remembering Pergae from Pamphylia, Anadolu climbing park, Lara’s endless beaches or sand sculptures. All these memories join him when he is building with his mommy wonderful games of Playmobil and wooden cubes recreating through symbolic games real events from his life.